Frederick Lowry (known as Fred) was born in Brisbane on the 25 July 1896, the third son and fourth child of Patrick Lowry and Ellen Elizabeth née Rowe. Patrick Lowry (Fred’s father) was 21 when he arrived in Brisbane from Antrim, Northern Ireland on the ship Wistow Hall in 1885. Patrick, the eldest of twelve children born to tenant farmers Thomas and Jane Lowry, had trained as a bookbinder in Belfast before taking up the opportunity of assisted passage to Queensland. In Brisbane he was to work as a bookbinder at a large printing firm where he was also to meet his future wife Ellen Rowe. He and Ellen Rowe married in 1890. With their family of five boys and two girls, they lived at 595 Boundary Street, Spring Hill. In August 1915 their eldest son Arthur enlisted in the Australian Imperial Force (AIF) to serve overseas in the Great War and at the end of the same year their third son Frederick also enlisted. 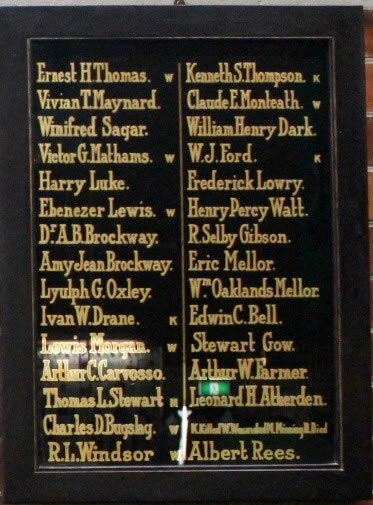 Only Frederick’s name is recorded in the Merrington Anzac Memorial Peace Chapel; it is printed on the Wharf Street Congregational Church honour board though both brothers gave their religious denomination as Presbyterian on their attestation papers. Fred worked as a warehouseman before joining the AIF on the 22 December 1915, aged nineteen years and five months. He had previously served eighteen months in the Citizen Forces. Private Fred Lowry was allotted to the reinforcements for the 49th Battalion, embarked on HMAT1 Clan McGillivray from Brisbane on 1 May 1916 and arrived in Egypt on 13 June for training before proceeding to England. Enroute to Egypt sixteen members of Fred’s unit wrote their names on a message, placed it in a bottle and threw it overboard. It was picked up by a lighthouse keeper in Ras Gharib in the Gulf of Suez who did as the message requested and sent it to Brisbane. The message was sent to Rev James Gibson of the Ithaca Presbyterian Church who reported the event to the Brisbane Courier. The message was published in this newspaper on 19 August 1916. In England, on 23 September 1916, Fred was transferred to the 41st Battalion. Australian Reinforcements were given only basic training in Australia and therefore training was completed in training units in England. Many of these training units were on the Salisbury Plains in Wiltshire and hence Fred found himself at a training camp in Larkhill, Wiltshire. It was here in November he was deprived of 14 days’ pay for being absent without leave for a period of 102 hours. On the 24 November 1916 his battalion was sent from Southampton to France, arriving on the 25th. The 41st Battalion entered the front line for the first time on Christmas Eve and, according to the history of the 41st Battalion recorded by the Australian War Memorial, ‘they spent the bleak winter of 1916-1917 alternating between service on the front line, and training and labouring in rear areas’. For a short time at the beginning of 1917 Private Lowry worked with the 2nd Australian Tunnelling Company on the Western Front, rejoining his unit on 8 April. The 41st Battalion was to become involved in some of the major battles in Belgium. It had a supporting role at the Battle of Messines that began in June 1917. It was not long after the launch of the attack at Messines that Fred was injured for the first time. On 10 June 1917 he was wounded in action. He had a gunshot wound to the arm, an injury for which he was treated at the Casualty Clearing Station at Rouen before he was admitted to the 6th Australian General Hospital, also in Rouen, on 11 June. He returned to the front on 24 August. At this stage the 41st was holding ground captured by two sister battalions, enduring continual rain, flooded trenches and heavy shelling. Many of the battalion’s platoons dwindled from 35 men to fewer than ten. On 5 October Fred Lowry was wounded in action a second time, this time with a gunshot wound to the groin (right thigh). His injury required hospital treatment and on 7 October he was transferred to the 1st Australian General Hospital at Rouen. On 17 October he was invalided to England. Fred was admitted to the 3rd Western General Hospital, Newport on 19 October. He was then transferred from Newport to the 1st Auxiliary Hospital at Harefield, near London where he was admitted on 18 December. His admission to Harefield, however, was not as a result of his most recent battlefield injuries. Six weeks prior to admission an enlargement of his jaw had been detected as well as glandular enlargement in the right submaxillary glands (close to the lower jaw). The cause of the problem was noted in his medical records as ‘neoplasm’. The tumour was deemed to be malignant. After admission to Harefield, Fred was granted furlough until 1 January 1918, at which time he was to report to the depot at Sutton Veny, a village near Warminster in Wiltshire. He took the opportunity to travel to Ireland to visit his grandfather in Ballybogey (on a farm a few miles outside Belfast) and his Great Uncle William in Belfast. He was able to spend Christmas with his family in Antrim, Ireland. It was at this time he learnt that his Great Uncle William’s son Bertie (Robert) had been reported missing presumed dead. Confirmation of Bertie’s death in the Third Battle of Ypres was confirmed later, and Bertie, a member of the 14th Irish Rifles, has his name recorded on the Tyne Cote Memorial. Fred was listed as AWOL again on 1 January 1918, obviously delayed returning from Ireland. On 4 January 1918 Fred was readmitted to the Harefield Hospital, and by the 26 January a diagnosis of fibrosarcoma (a malignant tumour) had been made and treatment had begun. An operation involving what was pioneering surgery of the time was undertaken at Harefield to remove the tumour. Three and half inches of his sixth rib were removed and used to repair his jaw. The operation also involved removal of the glands. It was successful but Fred was declared permanently unfit for duty on 23 February 1918 and prepared to return home. Fred embarked in England on 30 June to return to Australia on board the hospital ship Kanowna2 which left Cairo on 22 July. Enroute his jaw appeared to become loose and he was suffering painful swelling. The ship docked in Melbourne and then went on to Sydney, arriving on 3 September. In Sydney Fred was transferred to the 6th Australian General Hospital for further treatment. He was discharged from the AIF on the 27 February 1919. Fred returned to civilian life, first at Heussler Terrace, Auchenflower with his parents nearby. His brother Arthur stayed on with the AIF in London at the end of the war, returning to Australia in February 1921 with his wife Doris whom he had met and married in England. Fred’s mother died in Auchenflower in March 1926. His father died, aged 80, in June 1944 while staying with his eldest daughter Ellen in Oakey. After the war Fred went timber cutting on the north coast before moving to Oakey in 1921, where he moved into a house in Cherry Street. His sister Ellen had already moved to Oakey with her husband Frank Stedman (who had served as a mechanic in the Royal Australian Flying Corps during the war), and it was Frank who employed Fred in his garage to look after the clerical side of the business. In 1949, when Frank retired, he gave Fred a third share in the business. Fred became the proprietor of Stedman’s Garage and the local agent for General Motors Holden. His wife Jocelyn and son Alfred bought the other two thirds of the business. Fred ran the business until he retired in 1964. Fred met Jocelyn Taylor while she was visiting friends in Oakey following her parents’ deaths and staying at the Grand Hotel. Jocelyn, the daughter of Alfred Stephen (Fred) Taylor who owned and operated a bicycle shop in Cairns, had lived on the Darling Downs from 1917 to 1921. Her family moved from Cairns to Dalby after her father contracted tuberculosis and sought treatment at the newly established Jubilee Sanatorium in Dalby, built especially for the treatment of patients deemed to be in the curable stages of the disease. Her family moved from Dalby to Brisbane to access the Diamantina Hospital for Chronic Disease, then after a stint in the hospital for tuberculosis in Warwick (the dry climate of Warwick, Dalby and Stanthorpe having been selected by the Government to build Sanatoriums for the treatment of tuberculosis) they returned to Mareeba in north Queensland. It was here Jocelyn’s father (Alfred Stephen Taylor) died in August 1925 of tuberculosis and her mother (Oceanna née Griffiths) died of heart failure the following month. Fred and Jocelyn married on 23 April 1927. For a short time after their marriage they lived at the Grand Hotel before moving to a house in Newtown, Oakey. Eventually in 1929 they built a house on 4AK Road where they lived for the rest of their lives. Fred and Jocelyn had two children, Alfred (Fred) and Delphine (Dell), seven grandchildren, fifteen great grandchildren and (at the time of this account) ten great great grandchildren. Fred was an active member of the Oakey community. He was not only a founding member of the Oakey RSSAILA3 (now known as the RSL) Sub-Branch which was granted its Charter on 25 April 1934; he was also the club’s first president and first Life Member (awarded in 1947). He was to hold the position of President of the Oakey RSL Sub-Branch for 12 years before stepping down to take on the role of Chairman of the Building Committee charged with the responsibility of raising the finances to build the Soldiers’ Memorial Hall and oversee its construction. The Memorial Hall was opened in 1955. During the 1950's Fred continued to serve on the Sub-Branch’s committee as one of its three Vice-Presidents. He also, until the late 1960's, administered the Distressed Diggers’ Fund to assist veterans in need. Fred and the other Presidents and Life Members of the Oakey RSL were formally honoured with the unveiling of their photographs on honour boards that are now hanging in the foyer of the renovated and enlarged Oakey RSL Club. During World War II Fred was very much involved in fund raising for the Patriotic Fund and fulfilling the role as a recruitment officer in town. He was also Chairman of the Oakey State School P & C and President of the school’s Men’s Committee. His wife Jocelyn worked on the school’s Women’s Committee. Besides organising the digging of air raid trenches at the school, he also organised a number of working bees to make improvements to the school. Among these improvements was the provision of a water supply with the connection of the school to the windmill and bore. Fred died in Oakey on 27 March 1972, aged 75 years. Mrs Jocelyn Lowry remained in Oakey and died there in 1980. 2 The hospital ships of World War I were mostly converted passenger liners. Examples of these are the RMS Aquitania and the His Majesty's Hospital Ship (HMHS) Britannic. Members of the Queen Alexandra’s Imperial Military Nursing Service (QAIMNS) served aboard them on the wards. Others included the hospital ship Abessieh, the hospital ship Anglia, HS Devanha, HS Gloucester Castle, HS Somersetshire, HS Salta, HS Galeka, HS Caledonia and His Majesty's Hospital Ship Neuralia. I wish to thank Janelle Lowry (Frederick Lowry’s granddaughter) for her ready assistance by supplying much detailed information from family records and the photograph of her grandfather. Janelle has thoroughly researched her family’s history and the Oakey RSL Sub-Branch and has firsthand knowledge of her grandfather’s medical records at Harefield Hospital in England. Her willingness to share her knowledge and expertise during the preparation of this publication is much appreciated. Her own publications are listed in the select bibliography.